Tactical backpacks offer the backcountry adventurer something a little bit different to your standard hiking backpack. These packs are tough, heavy-duty workhorses specifically designed to provide optimal efficiency in a variety of activities - fishing, hunting, hiking, kayaking or just shooting some landscape photography in the wild. 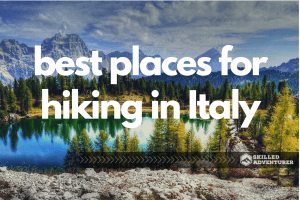 Choosing the best tactical backpack for your adventures, however, isn’t as simple as opting for the niftiest looking bestseller you come across online. Before you buy, we highly recommend getting to grips with the various specs, features and other factors that go into a tactical backpack’s makeup. 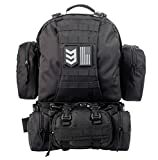 With that in mind, this article will bring you our lowdown on the various ins and outs of tactical backpack as well as an in-depth review of the best military backpack you can buy right now. 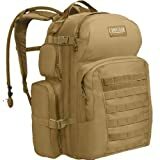 Choosing a Tactical Backpack: What to Consider? 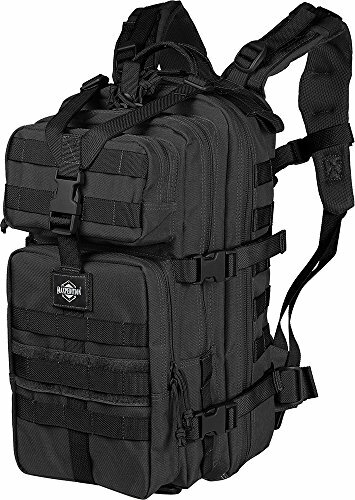 What are the Benefits of Owning a Tactical Backpack? Before we get down to our review, let’s take a look at the key features that will help you choose your pack. A number of factors go into the making of a great tactical backpack. The material and construction of your pack is one of the most important things to consider when buying. Ruggedness, durability, water-resistance, reliability and general convenience all depend heavily on the fabric and build. Look for tough fabrics such as 500D or 1000D nylon, a reinforced base, double-stitching, heat-sealed seams and decent-sized storage compartments. For weather proofing, look for polyurethane coating or materials such as DuPont Teflon Fabric to keep out the elements. If none of these are featured, a pull-out raincover will do the trick! The amount of storage you require from your pack will depend on how you plan to use it. For short day trips, a 30-liter capacity backpack will most probably carry everything you need. If you plan on carrying camping gear and spending a few nights away, however, shoot for a pack with a capacity of at least 45 liters. For greater versatility, a pack between 35 and 40 liters will serve your purposes for both shorter day trips and overnighters (if you can trim your kit down to only the bare essentials). When choosing a pack, comfort is king. If you can’t carry your load without chafing and other pains, pretty soon your new purchase will become all but redundant. The greatest contributors to a pack’s comfort are padding on the shoulder straps, back panel and hipbelt, and also load distribution. While this isn’t so important if you only plan on hiking short distances, if you envision long days in the backcountry with heavier loads, comfort should be a priority. Another factor which contributes to a pack’s comfort is ventilation. Most packs use a suspended mesh and/or molded foam back panel which creates an air-flow pocket between your skin and the material of the pack. While these ventilation systems are fairly standard across the board, some budget packs use uniform-girth and less contoured foam padding. This prohibits air flow and can result in a very sticky back after just a short while on the move! 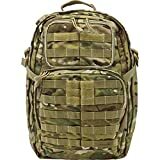 One of the greatest differences between a tactical backpack and a civilian backpack is the type of storage the pack features. 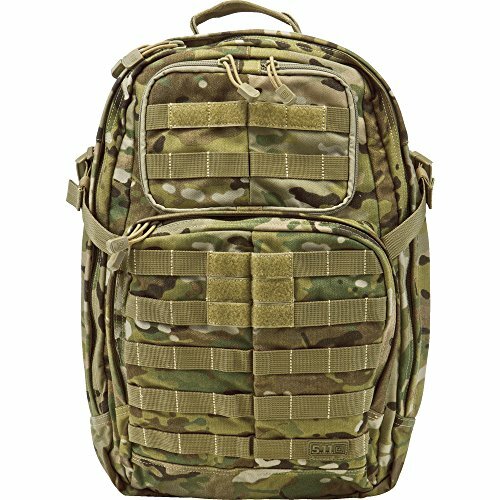 A tactical pack usually offers far more in terms of organizational efficiency by dividing its overall capacity into a number of smaller pockets and compartments. This allows you to keep different elements of you kit separate - wet and dry, breakable and non-breakable etc. Compartmentalization can also prove to be very useful whenever you need to locate things in a hurry and/or without removing the rest of the contents of your pack. 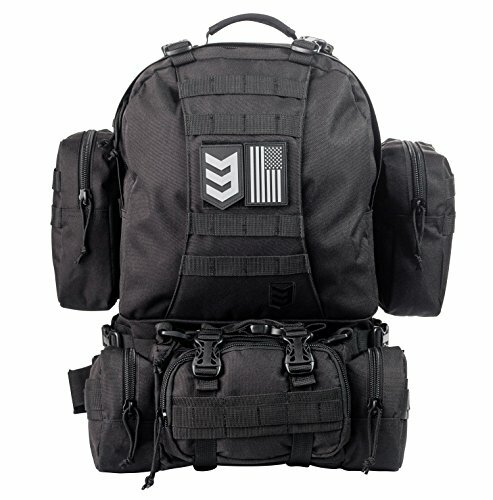 Backpacks that are compatible with MOLLE (or Modular Lightweight Load-carrying Equipment). Are those which feature webbing or mesh which allows you to attach compatible pouches and other items of gear to the exterior of your pack. This is particularly useful for expanding the storage of your pack and carrying equipment you need to access in a hurry. Many brands, such as 5.11 and Camelback, offer their own range of attachable accessories. This video from Alberta Bushcrafter offers some great insights into how to make the most of your pack’s MOLLE features. Compared to a standard hiking backpack, a tactical backpack offers a variety of worthwhile and desirable benefits. 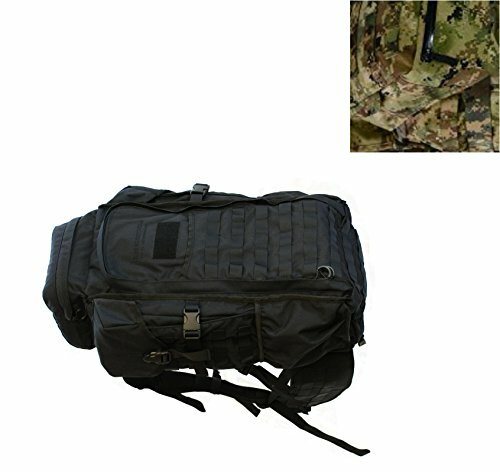 The most notable of these are compartmentalized design, versatility, MOLLE compatibility and superior ruggedness and durability. Perhaps the most important of the above features is the more nuanced, sophisticated and user-friendly organizational capacities offered by interior compartments, exterior pockets and MOLLE webbing. While standard outdoor packs tend to feature just one large central compartment and maybe two or three smaller pockets, tactical packs normally feature multiple ‘zones’ and separate compartments both inside and out. This allows you to organize your kit more efficiently and locate items without too much rummaging around. 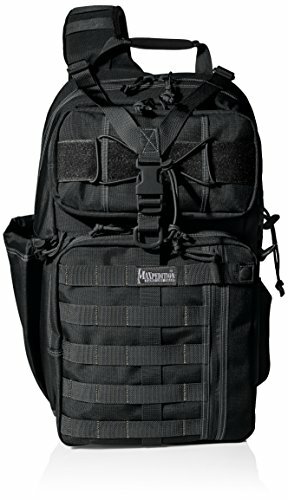 For more on the benefits of owning a tactical backpack, check out this article from offgridsurvival.com. Got all that? Great! Now let’s get down to business with our top picks of the best tactical backpacks for the money. This Eberlestock HiSpeed functions very much like a high-performing hiking pack with a wealth of tactical features. Its unique, ‘low-drag’ and low-profile design fits to the contours of your body and is ideal for moving through forest or dense scrub. The most impressive features, however, are the HiSpeed’s abundance of MOLLE-compatible webbing, comfort levels and super-convenient interior storage compartments. With almost 40 liters of capacity, this pack also offers great versatility and is suitable for day-trips and overnighters alike. 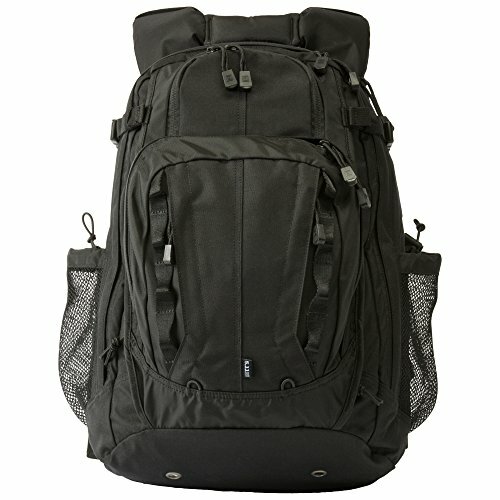 There are very few downsides to this pack beyond its weight (4.5lbs) and it price. 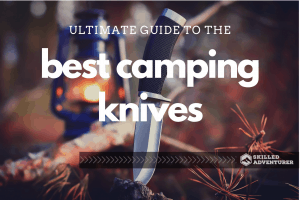 Give its larger capacity and overall quality, however, the HiSpeed could be a solid option for those seeking a tactical pack with enough storage room for a few nights out in the wild. For day trippers into the backcountry, the very robust, functional and feature-rich Falcon-II may well be the ideal backpack. It boasts superior construction to most competitors in its price range and a truly high-quality, super-efficient design. It’s made of 1050D nylon fabric, boasts a ton of storage compartments, and has plenty of MOLLE-compatible attachment points on the rear and sides of the pack. Other admirable features are the ventilated back panel, water resistant materials, reinforced stress points and hydration compatibility. Is this the best military rucksack out there for day trips? It’s certainly not far off it! The Falcon-II isn’t the most spacious pack in our review and also not the most generous in terms of shoulder padding. However, for lighter loads or minimalist travelers it offers great reliability and value for money. A bit of a wild-card entry in our list, the Kodiak Gearslinger is a tactical pack with a difference. The difference…it only has one shoulder strap! While this may seem like madness to some, we assure you it’s a feature well worth considering. 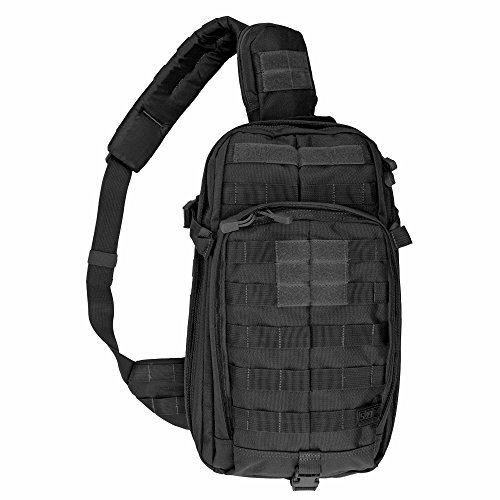 This sling-style tactical backpack offers great convenience and ease-of-access by allowing you to get into your gear without removing the pack. The Gearslinger also boasts very good water resistance, tough nylon fabrics, plenty of MOLLE-compatible webbing and a surprising number of storage pockets given its diminutive size. As for downsides, the Gearslinger is not the biggest and will set you back a few more dollars than you’d probably like for such a small pack. All in all, however, this is a very high-performing option that is a real contender for the title of the best MOLLE backpack on the market. Ideal for nature photographers, hunter, fishermen or others who need to access gear in a hurry! For longer trips in the backcountry, the Kelty Redwing might just be the pack you’re looking for. This lightweight pack boasts a 50-liter capacity, a ton of storage pockets and uses a very user-friendly front-loading system to aid packing and unpacking. It also features an adjustable frame system, more than adequate padding on the back and shoulders, and hydration bladder compatibility. 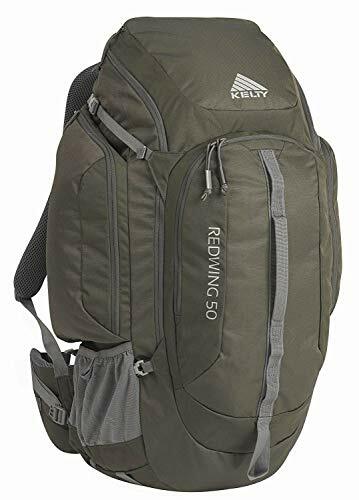 On the downside, the Redwing 50 is not the most waterproof of packs and has only a very small band of MOLLE-compatible webbing on the rear of the pack. For those of you looking for a hybrid pack that includes the best features of both hiking backpack and military-style backpack, however, the Redwing ticks your box! For supreme comfort from a high-capacity pack, you might not have to look any further than the Camelback BFM. This 48-liter, MOLLE-compatible pack boasts enough space and storage options to carry all the gear you’ll need and keep it well organized. Most importantly, moreover, you’ll do so in comfort. This pack excels in the comfort-stakes by including a very generous amount of padding in the back panel, shoulder straps and hipbelt. It’s also very functional, boasting an integrated raincover, hydration compatibility and plenty of interior and exterior compartments. The drawbacks to this pack are its price, weight and slightly less rugged materials. All in all, however, this is a very well-thought-out pack that makes up for its flaws with superior comfort levels. The 5.11 Tactical Rush 24 is a very rugged, well-made and comfortable pack that boasts just about the best compartmentalization you’re likely to find. This pack’s wealth of pockets and storage compartments let you keep things nice and tidy. On the outside, MOLLE-compatible loops and mesh offer great versatility for carrying additional items. But organizational capacities aren’t all the Tactical Rush has going for it. It’s made of tough, 1050D nylon fabric, is water resistant, and boasts plenty of padding on the shoulders and back. While pricey and a touch on the small side for overnight trips, this is a very well-designed piece of kit and a true contender for best military backpack out there! The 5.11 Tactical Covrt 18 looks like a standard outdoor backpack but packs a number of design features that make it one of the best military backpacks out there. It boasts a decent amount of exterior MOLLE webbing, a wealth of storage compartments, an interior hydration bladder sleeve and double-stitched seams. It’s made with 500D water-resistant nylon and in terms of quality offers a step up from most budget items in our review. The downsides to this pack are its price, lack of a hipbelt, and a pair of grommet holes on the base that are apt to let water leak into the pack if set down on wet ground. It’s also a little on the small side for overnight trips, but for one-day adventures it offers a reliable and efficient gear-carrying solution. For a tough, reliable, affordable and very spacious pack made for longer excursions in the wild, the Paratus 3-Day Operator’s pack might just offer everything you’re looking for. This feature-rich backpack boasts 600D PVC-backed nylon, 2,500 cubic inches of storage, double-stitched seams and full MOLLE compatibility. Other endearing touches are the abundance of storage compartments, a detachable day-pack and a ventilating, molded EVA back panel. On the downside, the Paratus lacks weatherproofing and the hipbelt is a little short on padding. Otherwise, this is a superbly practical pack that offers great value for money. 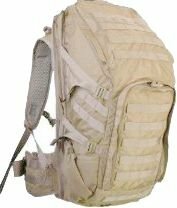 Maybe one of the best budget military backpacks you’re likely to find. The 5.11 Rush Moab (Mobile Operation Attachment Bag) is a very user-friendly, sturdy, haversack-style pack that’s high on convenience and low on hassle. If you don’t want to have to stop every time you need to access your gear, the sling-around design of this pack just might be ideal. The Moab boasts plenty of pouches, pockets and storage compartments to keep all of your gear well-organized. It’s also very well made, water resistant and features a ton of MOLLE webbing and back panel padding. While this is smaller than most packs in our review, for day trippers or those of you who want to be able to grab your gear on the go, this tidy little pack offers a solid, reliable and very practical option. For those who want potentially one of the best tactical backpacks your money can buy - and are willing to hand over some serious dough to get it - the Eberlestock Halftrack could well be your gal. The overall quality and performance of this pack are, quite frankly, awesome. 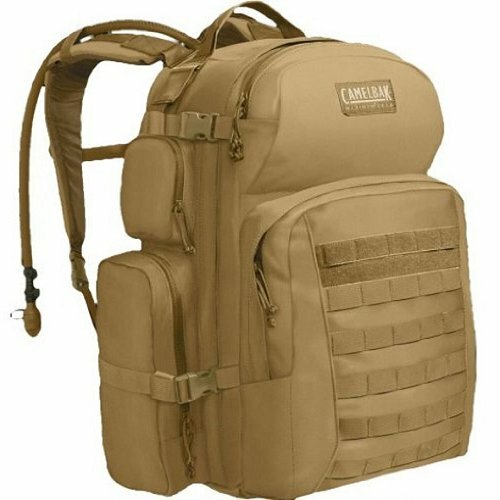 It boasts a ton of MOLLE-compatible webbing, 1000D nylon fabric, double stitching, supreme comfort, and just about everything else you could look for in an overnight tactical backpack. 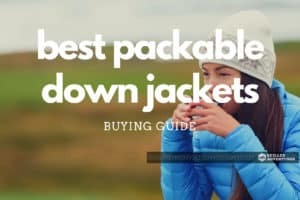 Features-wise, it includes a pull-out raincover, exterior hydration pouches, plenty of storage compartments and pockets, and a handy internal divider. It’s also a front-loader, meaning accessing your gear and packing it is a cinch. Well, you didn’t think you were getting all that quality on the cheap, did you? Yes, the Halftrack is pricey…very pricey! It’s also the heaviest pack in our review. Whether or not these are deal-breakers is for you to decide, but neither detract from this beast of a pack offering great value for money. The above list demonstrates that tactical backpacks are far more specialized than many are apt to give them credit for. 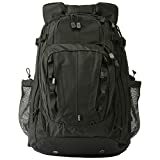 Choosing the best tactical backpack for you, therefore, will require a thorough assessment of your needs and your anticipated use of the pack prior to making a purchase. Despite all variations in pack type we’ve covered, in this review we’ve sought out what we deem to be the most important factors in selecting our top pick: versatility, practicality and value for money. In each of these attributes, we’ve found the Maxpedition Falcon-II to stand out as a clear winner. The Falcon-II is a very well-made and user-friendly tactical backpack that does just about everything you could want a pack to do. It’s tough, durable, fantastically practical and contains plenty of highly desirable features - an abundance of external and internal storage compartments, MOLLE webbing, hydration compatibility, a reinforced base and water-resistant fabric. Compared to its closest competitor, the Eberlestock Halftrack, the Falcon-II offers much better value for money and comes in at almost half the weight. Another honorable mention goes out to the 5.11 Rush Moab, which the Falcon-II managed to oust out of first spot on account of the Falcon’s superior handling of heavy loads and higher capacity.